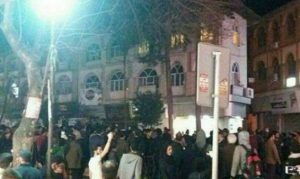 Iran Protests continues in Kazerun, despite repressive measures and mass arrests of the youth by IRGC forces. 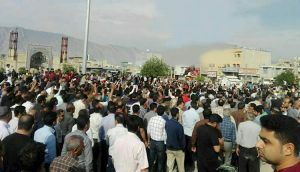 Protests continue to rage in Kazerun as the youth of the province remain determined to vent their frustrations with the clerical regime. The protests continued throughout the night on Thursday the 17th of May, and into the morning of Friday the 18th of May. The protesters turned out in spite of intense repressive measures taken from the regime. On Wednesday, the regime’s state security forces opened fire on protesters, killing two and leaving many more injured. The mullahs have also brought in anti-riot units from nearby Isfahan and beyond to arrest protesters and quell the demonstrations. The security forces attacked the demonstrators with rubber bullets and tear gas canisters, leading to a number of injuries. Clashes between the regime’s forces and the protesters broke out in several locations. Vehicles were burnt, as were several government centers. Protesters used burnt tyres and cars to block the roads and prevent the movement of the Revolutionary Guards and more anti-riot units. The regime’s agents have threatened the citizens of Kazerun with severe repercussions for anyone that shares information about the situation in the province. The regime is adamant that no information be leaked to the international press and no protesters lying in the hospital be allowed to share their stories. 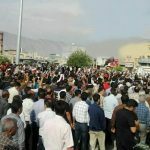 The regime disconnected Kazerun’s internet in an attempt to silence the public and prevent news of the protests spreading across the country. The official line from the regime, as reported by IRNA news agency, is that some people attempted to “set the Friday prayer’s place on fire” in Kazerun. Mullah Khorsand said, “some people on Friday morning broke one of the doors of the Friday prayer’s place in Kazerun and threw firebombs inside, which resulted in serious damage to an air conditioner”. The Deputy Governor of Fars province, Hadi Pajouhesh Jahromi, added that “the protesters burned a bank building on Friday morning and damaged the public property”. The mullahs repeatedly asserted that the “situation in this city is completely under control”, calling the clashes “scattered skirmishes”, and urging the public “to ignore and not trust the news broadcast in the social media and foreign networks”. The leader of the Iranian opposition, Maryam Rajavi, expressed messages of solidarity with the brave protesters. Rajavi hailed the heroic martyrs in Kazerun, called for the release of those imprisoned by the regime, and urged the Iranian public to assist those that are wounded. Her message for the international community was to dispatch a UN delegation to the country. She urged a representative for the UN High Commissioner for Human Rights to visit the country and see the mullahs abuse of Iranian citizens for themselves. The US Secretary of State, Mike Pompeo pledged the support of the Trump administration. He tweeted a message of solidarity with the Iranian protesters on Friday morning (May 18th). It read, “we support the Iranian people who are demonstrating against an oppressive government. 3 deaths & internet disruption show the regime’s true nature”.